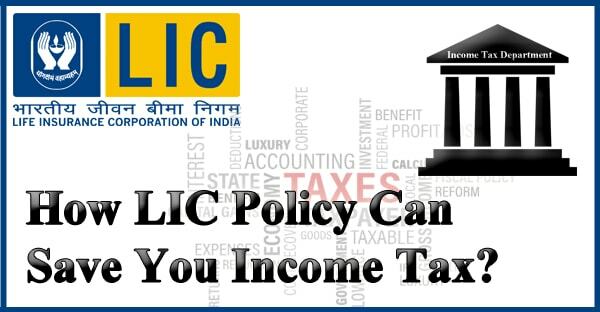 Home General How LIC Policy Can Save You Income Tax? An Income tax is an amount paid to the government as a part of our income. The government uses the amount to develop the country and provide road and various other services to society. Every individual who has an income more than the 2.5 Lakhs has to pay the income tax to the government. Ministry of Finance provides the taxpayers to subscribe to a certain scheme or account to provide exemption on the tax like Sukanya Samriddhi Yojana Account offers the tax benefit to the parents of the girl child. Similarly, some LIC Policies also offers such benefit that helps the policyholder in savings tax. In this article, we will discuss various section and provisions that help the individual to save income tax by using the LIC Policies. Any life insurance bought on or before 31st March 2012 in your own name or in the name of spouse or child, then up to 20% of tax deduction can be availed on the premium paid towards life insurance policy. Any life insurance bought on or after 1st April 2012 in your own name or in the name of spouse or child, then up to 10% of a tax deduction. If the premium paid in a financial year exceeds 20% of the actual capital sum assured, then tax benefit will be applicable only for the premium up to 20% of the sum assured. The amount exemption under section 80D is up to Rs15,000 and additional deduction up to Rs15,000 is applicable for the parents. If the parents are senior citizens, then up to Rs20,000 is permitted for the tax deduction. Within the tenure of the policy, the policyholder is allowed to make any payment of up to Rs.5,000 on account of preventive health checkups. Surcharge: In the cases of persons covered under the above categories having a total income exceeding Rs. 50 Lakh but up to Rs. 1 crore, the income tax as calculated above be increased by a surcharge at the rate of 10 percent of such income- tax. If such income exceeds Rs.1 Crore, the rate of surcharge will be @15%. Education Cess: An additional surcharge called ‘Education Cess’ at the rate of 2% on the amount of Income tax and surcharge in all cases shall be levied. Secondary and Higher: An additional surcharge, called the “Secondary and Higher Education Cess on income- tax” at the rate of 1% of income-tax and surcharge (not including the “Education Cess on Income-tax”) in all cases shall be levied.